Bose introduces QuietComfort 20 in-ear noise-cancelling headphones and Mini Bluetooth speaker | What Hi-Fi? Bose has added two new products to its range: the QuietComfort 20 in-ear noise-cancelling headphones (£260), and Bose SoundLink Mini Bluetooth speaker (£170). Both will be available this summer through the Bose website. 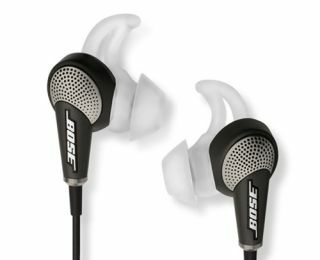 The QuietComfort 20s are Bose's first in-ear noise-cancelling models, and weigh just 1.5 ounces. Bose engineers have placed two tiny microphones in each earbud: one senses the sound approaching, the other measures the sound inside. The measurements are then sent to a digital electronic chip located in the control module found on the headphone chord. The chip – exclusive to Bose – calculates an equal and opposite noise cancellation signal within a fraction of a millisecond. Bose says its Truport technology uses ports on the earbuds to reproduce "deep lows, and lifelike vocals and instruments", while active equalisation tunes the frequency response for "improved, natural sound". New proprietary StayHear+ ear tips feature an improved conical design for a better fit in the ear and to block external noise. Owners can use the BoseQuietComfort 20s in one of two ways: either with full noise cancelling engaged, or in 'Aware mode' which keeps the music playing, but allows external sounds such as a car horn beeping or a friend talking to be heard. The headphones include an integrated in-line mic and controls that enable you to take phone calls. Two models are available: the Bose QuietComfort 20 which work with most Android, Windows and BlackBerry smartphones; and the Bose QuietComfort 20i designed specifically for use with Apple iPhones, iPads and iPods. Also announced by Bose today is its SoundLink Mini Bluetooth speaker, available from July 11th. It's designed to fit in the palm of your hand, connects wirelessly via Bluetooth to a laptop, smartphone or tablet, and comes in an aluminium housing. At 680g it weighs 50% less than the original SoundLink Mobile speaker, says Bose, and measures just 5 x 17.8 x 5.8cm (hwd). Proprietary passive radiators are driven by new, custom-designed Bose transducers. And Bose uses DSP (digital signal processing) to create a "tonally balanced sound at any listening level". The Bose SoundLink Mini uses Bluetooth A2DP, comes with a charging cradle and has a lithium-ion battery good for a claimed seven hours of listening. It's available to pre-order now directly through the Bose website.